Hauser: Dr. Petrides can you tell us your medical and training background? Petrides: I underwent formal medical training at Guy’s Hospital in London and then osteopathic training at the British School of Osteopathy, followed by sports medicine training and further training in musculoskeletal medicine. Hauser: Are you the founder of the Blackberry Clinic or the medical director? How did that association come about? Petrides: I founded the Blackberry Clinic in 1988 and I am the medical director. We moved to a new site in 1996 and have built one of the largest independent multi-disciplinary musculoskeletal clinics in the country. We have 22 treatment rooms, a membership and rehabilitation gymnasium, an exercise/conference studio and four health and well being medical screening centres in the South of England. We also have a fluoroscopy theatre and recovery suite which is where I carry out my Prolotherapy treatments. Hauser: What got you interested in the field of sports medicine and pain management? Petrides: My initial interest in sports medicine focused on back pain since it is one of the most common injuries and many of my patients had already had the more popular forms of orthodox and complementary medical treatments, so I needed to come up with different types of treatment for the difficult cases. This led me into spinal intervention procedures under image guidance such as epidurals, nerve blocks, radiofrequency neurolysis and Prolotherapy. The Blackberry Clinic now has 25 different practitioners in fields such as physiotherapy, osteopathy, chiropractic and there are three other doctors who are all specialist musculoskeletal and sports physicians. We are mostly private but we currently have an NHS contract for a musculoskeletal service. Hauser: You are traditionally trained in all the various pain techniques such as epidural injections and other steroid shots. What led you to get additional training in Prolotherapy? Petrides: My training in Prolotherapy was obtained simply by observing my predecessor in the Clinic but also on research around the subject and observing other practitioners. The system we use is based on that described by James Cyriax who pioneered the procedure in this country. There is no formal hands-on Prolotherapy training in the UK and it is something I have wanted to head up at some point. Hauser: Recently you treated the captain of the English World Cup team, Rio Ferdinand. How did that come about? What condition did he have and how was his response? Petrides: I was referred the England football captain, Rio Ferdinand, by the Manchester United doctor after he had listened to a presentation of mine at the Annual Congress of the British Association of Sport and Exercise Medicine in Edinburgh in 2009. Although I cannot discuss the exact nature of his problem, the indications for Prolotherapy were quite typical of many of our patients, and he had apparently been performing sub-optimally for the previous 6 months. After the treatment he returned back to the England team and was elected captain to lead England into the World Cup finals in South Africa. Unfortunately, he recently suffered a knee injury which was totally unconnected. 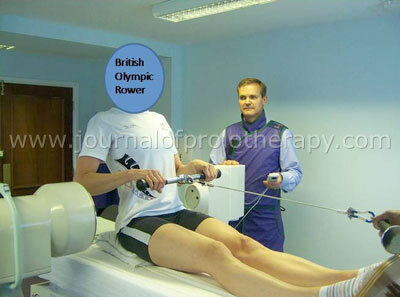 I have a case series of 15 International rowers who have all returned to full training after Prolotherapy. Two of the rowers were Olympic Gold Medalists. 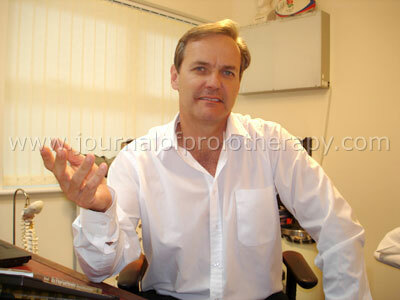 Dr. Petrides in his office, Blackberry Clinic, located in the United Kingdom. Hauser: For which conditions do you feel Prolotherapy should be first line therapy, instead of being the therapy of last resort? Petrides: I tend to use Prolotherapy after patients have tried manual therapies or corticosteroid injections but have experienced a temporary response. Secondly, when patients present to me they have often tried extensive physical therapies and injections with no effect and it is only when we use Prolotherapy combined with an intensive rehabilitation programme and extensive advice that they start to improve. Hauser: You also do manipulation. When do you use that modality and how do you combine it with Prolotherapy? Petrides: I do use manipulation with my background in osteopathic training. Although manipulation was advocated in some of the trials on Prolotherapy as a procedure that is carried out before each session of Prolotherapy, I do not now routinely use that approach and it does not seem to have altered my success rate. Hauser: You are involved with the British Institute of Musculoskeletal Medicine? Can you tell us about that organization and your role? Petrides: The British Institute of Musculoskeletal Medicine is the main interest group in the UK serving the needs of musculoskeletal and orthopaedic physicians, and which represents the interest group in pushing towards recognition of the specialty. I sat on the Council for many years and organized 12 annual conferences with 500 or so delegates, but now I am not involved on the Council. I teach on the diploma of musculoskeletal medicine and on the roadshow, a one day seminar for general practitioners which is held every few months throughout the British Isles. I am closely involved with the Council at present on initial discussions regarding assisting the General Medical Council in credentialing musculoskeletal physicians by defining their role and defining the specialty of musculoskeletal medicine itself. Dr. Petrides working with one of his athlete patients. Hauser: Can you tell us about the various courses that are offered through that organization (BIMM)? Petrides: In the UK, the National Health Service are employing many GPs with a special interest in musculoskeletal medicine in order to run musculoskeletal services but there is also a role for the more specialised practitioner who receives referrals from these GPs with a special interest. The British Institute of Musculoskeletal Medicine (www.bimm.org.uk) offers a modular course which can result in a diploma of musculoskeletal medicine if delegates decide to take the exam. The organization runs several other courses around the country aimed at different levels of knowledge based on spinal injections, examination and treatment techniques. It is closely allied with FIMM (The International Federation for Manual/Musculoskeletal Medicine) which has offered a platform, or forum, for representatives of the national societies to exchange experience and knowledge. There is also a FIMM international academy which recognizes the existence of diverse schools of manual medicine in Europe and osteopathic medicine in the USA. The academy supports the future work of the Health Policy Board of FIMM in its lobbying of international medical organizations with respect to the validity and status of manual and musculoskeletal medicine. Hauser: What is the state of Prolotherapy in England? Is it growing in popularity? Where would you like Prolotherapy to be in England a few years from now? Petrides: Prolotherapy has been around for about 50 years in the UK and it is growing slowly in popularity purely because there is no acknowledged career structure within the NHS for musculoskeletal physicians. If there was enough finance then my preference would be to see a properly randomized double blind control trial on Prolotherapy using specific diagnoses and demonstrating the benefits of Prolotherapy in different spinal problems. Unfortunately, research on low back pain is notoriously difficult and expensive to do properly. In addition, the use of dextrose cannot be patented and so pharmaceutical companies are unlikely to be interested in helping fund studies of that kind. Interestingly, I find that the addition of phenol and glycerol to the dextrose solution significantly enhances the efficiency of the injection. Hauser: Do you have a sense of the acceptance of Prolotherapy in Europe? Petrides: I am uncertain about the European acceptance of Prolotherapy but I recently received a referral from Hans Müller-Wolfhart’s clinic in Munich for Prolotherapy on a patient of his. Hauser: Is there anything you else you would like to say about Prolotherapy or pain management to the readers of the Journal of Prolotherapy? Petrides: I was interested to see your technique on YouTube. I am soon to be launching a new website which will include videos of my technique on YouTube, which I must say is less extensive than yours, but more specific in that it is done under X-ray guidance to 13 different sites at L4/5 and L5/S1 along with the posterior sacroiliac ligament and iliolumbar ligament insertions. Hauser: When can we teach a course together? Petrides: I believe there may only be 20 practitioners in this country using Prolotherapy, so teaching a course may not be cost-effective and also our differing techniques may be an issue. But I will bear you in mind if I organise a course on Prolotherapy and we decide to collect different practitioners using different techniques. We did actually get Dean Reeves, MD over here, from the USA, to demonstrate his technique several years ago.